I remember going to my local dollar theater at fourteen in what was probably early 2002 to see Ocean's 11 and more or less being taken with what was this star-studded affair where no one was taking themselves too seriously and having a total blast in this smooth and effortlessly cool remake of the 1960 Rat Pack movie. After two varied, but equally entertaining sequels in 2004 and 2007 it seemed as if the run was done for these crime caper comedies, but Warner Bros. has figured out a way to re-tool that franchise with Pleasantville and Hunger Games director as well as close friend of original trilogy helmer, Steven Soderbergh, Gary Ross to write and direct an all-female version of those movies. While it may feel like this is little more than a studio mining a brand for all it's worth, Ross and Soderbergh actually developed this idea together with Soderbergh serving as a producer on this new film. One even wonders if Soderbergh returned to feature directing this past year with a southern-fried version of an Ocean's movie in Logan Lucky to give Ross a tutorial on his process for making this type of film. Doubtful, but I wouldn't be surprised to find out Ross was on set more than a few times. All of that said, the idea seems to be to jump-start a new franchise with a new cast and this looks to be going swimmingly so far as the cast Ross has assembled is pretty stellar with a good mix of heavy hitters, unknowns, and diamonds in the rough that some know about, but are about to be exposed to a much broader audience. Also, Mindy Kaling seems like she's going to have a great 2018. 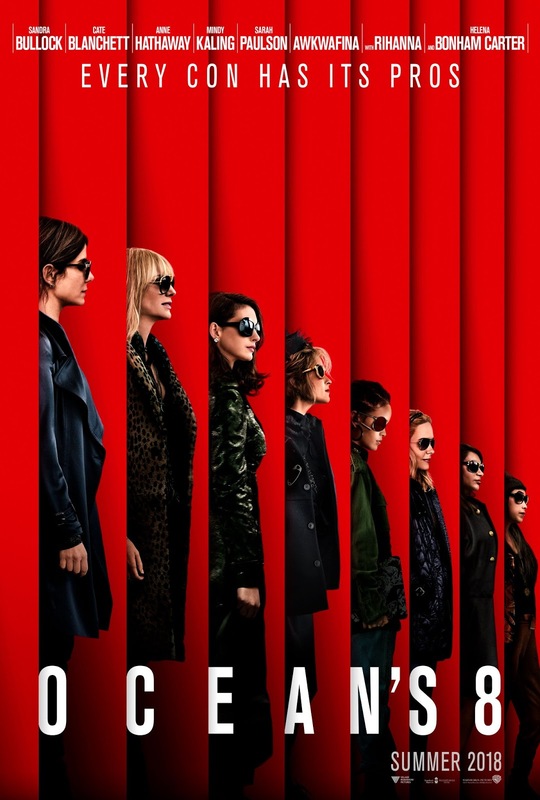 And while this new movie is only tangentially related to Soderbergh’s Ocean’s trilogy, Ross certainly took aesthetic cues from his friend as the suave and stylish essence of Soderbergh's films is still intact, Sandra Bullock does star as Debbie Ocean, the sister of George Clooney’s Danny Ocean, who gets a nod in the trailer. In the film, Debbie is fresh out of prison and ready to assemble a team of her own to pull off a unique heist at the Met Gala. Ocean’s 8 also stars Cate Blanchett, Anne Hathaway, the aforementioned Mindy Kaling, Sarah Paulson, Awkwafina, Rihanna, Helena Bonham Carter, Richard Armitage, and opens on June 8, 2018.